GUADEC 2010 is about to begin and, unfortunately, I will not attend it this year. But I think it’s a good time to introduce a small cool project I’ve been gradually working on in my (rare) spare time. I’d like to present you The Board. What is The Board? It’s a space for quickly placing daily records: photos, video, audio, text, and more. Think of it as a combination of a note-taking space, a photo or video booth, photo album, sketching board, a digital diary, and (in the future) a nice way to quickly share stuff with your friends. Click on the image above to watch a video showing how the app works now. The focus is to provide a quick, simple and visually engaging way of keeping small records of your day. I envision The Board as a sort of especial workspace in GNOME. Something that’s “always there” and is tightly integrated with the desktop. For now, it’s simply an app that always runs in full screen — so that I can demonstrate the idea more accurately. Add to The Board. The Board can be used a quick note taking app. Someone is telling you a phone number you want to take note of? Switch to The Board, press “s” (or use the toolbox) and quickly write down the phone number. You have a favourite photo for the day? Switch to The Board, press “p” and select the photo file (similar thing for video and audio). Want to write down some ideas before you forget them? Switch to The Board, press “t”, and you have a nice lined note paper to write in. Want to record a quick video with a happy family moment? Switch to The Board, press “v”, and you can start recording the video. You got the idea. For now, I have only implemented simple text elements (lined paper and sticky note) and photo. There’s more coming (see “Next steps” below). One page at a time. You don’t need to remove old things or “manage” the things on The Board. Once you filled the whole screen space, just create another page! Your previous content will be saved and can be easily accessed through the Pages toolbox. You don’t even need to worry about saving your content. The Board saves the latest content of your page every time your change it by editing, adding or removing things, etc. What’s the current state? The initial core code and framework is in place. But there are obviously tons of things to be done. The app is not even installable yet! I’m still sketching the API to implement plugins. Video and audio elements are not implemented yet. The graphic design is poor (as I did it myself using some random graphics from internet) and there are lots of open interaction design questions to be sorted out. In order to run the app for development purposes, you’ll need a full GTK+ 3 stack, and latest (as in git clone master) clutter, clutter-gtk, mx, gobject-introspection, and gjs. The official code is in gitorious now. How can I help? If you want to hack on The Board, grab the code, build it and run it. Play with the app and bring ideas, fix bugs, implement new features, etc. Business as usual. If you’re an interaction designer, you can help by solving some of the hard questions still needing answers in terms of usability and user experience :-) On the graphic design front, I’d really like to have better graphics for all UI elements. I have to find a nice free (as in freedom) font to use in the UI. I’m temporarily using this funny freeware font. Users can help by giving constructive feedback on how we can make The Board more interesting, useful, and exciting. In any case, contact me and we can discuss how and what to do. So, what are the next steps? As I said before, there are tons of things to be done. Here’s what I have in mind in terms of short-term and long-term roadmap. Come up with a simple Plugin API. By plugins I mean either the implementation of new types of things to be added to The Board’s pages or new types of background — which can contain animations and react to user events by the way. For example, a background could be a wooden table with a light switch that can be turned on and off. Or the background can change colour depending on the current time of the day. Integration with other apps. Basically, users should be able to add new things to The Board through existing apps. For example, An Add to the Board option in Nautilus when right-clicking image, video, audio, or text files. Similar thing with apps like EOG or F-Spot — an Add image to The Board option. Integration with web browsers would be nice too: saw an interesting image on a webpage? Just add it to The Board. 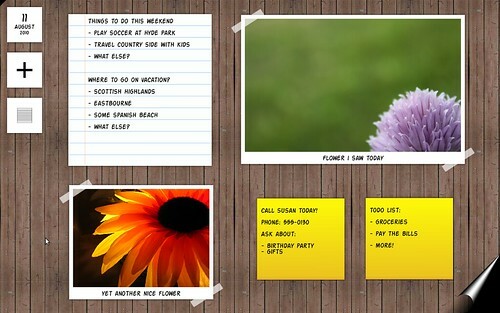 Or maybe add your text selection as a sticky note in The Board. Still on the app integration front, I’m doing some work to integrate a Cheese dialog into The Board so that you can add photos and videos from webcam without having to switch apps. Online experience. This is one area that I’m still unsure how to handle. My initial idea is that you can share anything in The Board pages. From a user perspective, you would just add something to The Board and click “Share”. On the server side, I’m thinking of having a WordPress instance with a plugin to present The Board’s custom types just like you see them in your desktop. i.e. sticky notes in The Board should look exactly the same in your “Board webpage”. The advantage of implement this as a WordPress plugin is that it would be installable in a large number of personal servers from day one. Tumblr is definitely the main inspiration in terms of online experience here as it offers a rich media blogging approach. Anyway, you probably got the idea after reading this (maybe too) long blog post. If you got excited about The Board and want to help with code, graphics, design ideas, or just simple feedback, post a comment here or contact me directly. I’ll be hacking on The Board in my spare time as usual. But things can definitely move much faster if it gets more people involved. If you’re into writing simple and beautiful software using GNOME’s latest technologies, this should be a fun project to contribute to!